The respective transfer during the tour will enable to present the finest bike routes and most beautiful cities between Vienna and Budapest. For this bike tour you don't need to be sporting ace. With us, you will cycle through the nature reserve along the Danube and the steppe zone of the Lake Neusiedl. This is our 1stcycle tour in two completely different landscapes. Day 1 - IMPERIAL TOWN VIENNA. - Arrival to the Hotel of Vienna in your organisation. Accommodation in the hotel of Vienna. at our contractual hotel in Vienna. Day 2 - DANUBE-AUEN NATIONAL PARK- After breakfast the tour guide will welcome you at 8:45 a.m. in the hotel. (Meeting point: hotel reception) Route briefing. The bikes will be adjusted and tried out here - the cycling adventure is finally ready to start. There is a beautiful stage ahead on the Hubertus-embankment along the Danube (nature reserve!). We cross Bad Deutsch Altenburg and Petronell-Carnuntum. In the afternoon, transfer to your hotel in the area of Komárom / Budapest. Day 3 - 4 - RIVER CITY Györ (Raab). - We start in the ancient fortress city Mosonmagyarovar, situated at the Hungary's western gate. We bike through small typical villages using the dam cycle path and country roads before we arrive at Györ. The medieval town centre is located on the confluence of Rivers Raab and Mosoni-Danube. The "Danube & AUDI-city" Györ, famous for its picturesque baroque downtown. Day 4 - BASILICA OF ESZTERGOM ("GRAN at the DANUBE"). 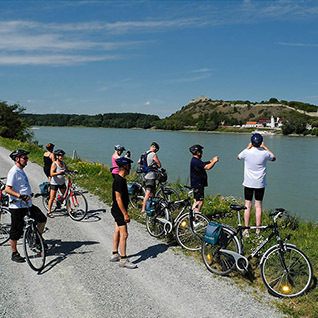 - Today we cycle to the old coronation city Esztergom, head domicile of the Hungarian Catholic Church and world famous for its imposing cathedral. The dome stands proudly above the Danube. From here you can take a breath-taking view of the beautiful Danube valley in Hungary. Day 6 - NATURE'S PARADISE LAKE NEUSIEDL, THEN VIENNA. - Today we breathe Austrian air again. Bicycle ride through quaint villages with their typical atmosphere and old pilgrimage site. Stork's nests adorn the roofs. We cycle through the wild romantic steppe area of the protected landscape "Lakes-Corner" (diversity of fauna and flora). Directly on the lake lies Podersdorf with its lighthouse. Transfer from Neusiedl am See to Vienna (to the car park at 'Rail-Station-West' in the centre, at about 5:30 p.m. finish) where your eventful cycling holiday come to end. 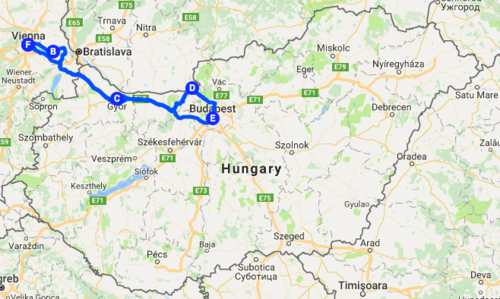 Homeward journey or in the case of reservations of extra night/s, free transfer to our contractual hotel Vienna (-extension possible on your own cost-), or even on the whole way to Budapest. Additional nights in our contractual hotel Budapest on one's own cost to book also. Informative city tour of historic Budapest. Bus/van transfers according to the program description. Service/Follower bus/van for luggage transport from hotel to hotel. Special bike-transporting trailer for every bicycle & spare bikes. Guided visits as per program description. (Entrance fees not included). Service Telephone (cell phone) at the both bike tour guides. Full technical support, include transport your own bikes along the way. - Your arrival and departure between Vienna and your home and Budapest and your home, before/after the tour. - Travel insurance (accident and health), as well as your official free European Health Insurance Card(European guests only).